See what makes hurricanes tick by making one yourself—with our Forces of Nature interactive! Teachers, scroll down for a quick list of key resources, including today’s MapMaker Interactive map and our Educator of the Week’s guidance on teaching about natural hazards. With Weather Underground’s data on Hurricane Joaquin’s latitude, longitude, and strength, and using this map as a base, plot the storm’s course yourself. Send us your results in the comments below, and we might share them on the blog! Hurricane Joaquin barrels through the Bahamas on October 1 in this dazzling image from the GOES West satellite. According to Nat Geo News, “A drop in wind shear and an unusually warm pool of water in the ocean have contributed to Joaquin’s growth into a powerful hurricane.” What is wind shear? Wind shear describes changes in wind speed and direction over a set distance. How does a drop in wind shear strengthen a hurricane? How does warmer water strengthen a hurricane? What are some natural hazards associated with hurricanes? Look at bookmark 4, “Characteristics of Hurricanes,” in our great Forces of Nature interactive, for some help. Most models predict Hurricane Joaquin will not make a powerful landfall in the United States. So why do most meteorologists predict such a wet weekend for the East Coast? Watch Joaquin, as well as the low-pressure system blanketing the East Coast, in this typically terrific video from the good folks at NASA and their GOES East satellite. 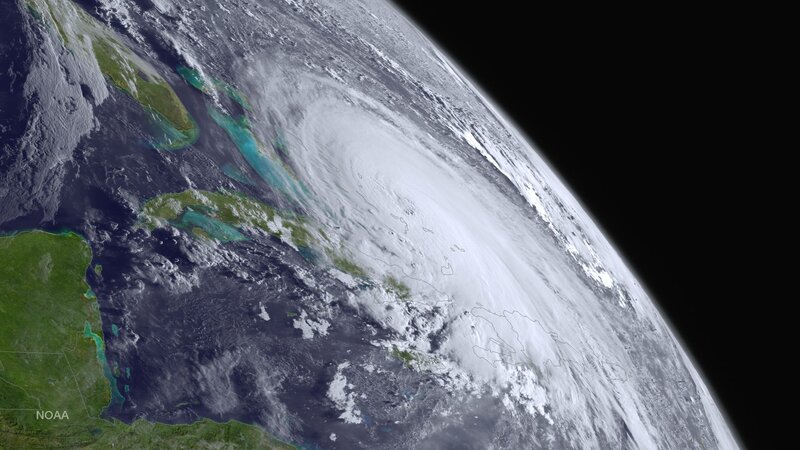 Nat Geo: What Makes Hurricanes Like Joaquin Tick? Previous Previous post: Plague’s Patient Zero?